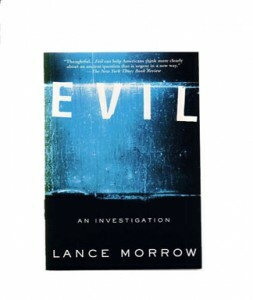 We owe a debt to Lance Morrow for encapsulating the problem of evil in this work. Those of us who deal with global strategic issues tend to ignore the more metaphysical aspects of human behaviour: we are, in many cases, not comfortable with that which is difficult to measure or define. Indeed, in today’s anti-religion zeitgeist, it takes some modicum of courage to grapple with the concept. It is undeniable for those of us who have been immersed in ethnic conflict that evil exists: why it exists and how it operates, however, is tougher to grasp. It is a chilling book for the non-sociopaths among us. He examines why evil has an affinity for children, how indifference is a form of evil, why sentimentality is one of evil’s best tools. And insightful: “much evil is done by people as small, as ordinary, as the supervisor. It is usually done precisely because its authors feel so keenly their own smallness and ordinariness, and it may be, wish to repair those defects in the only way that small and ordinary minds an conceive to do the job: by accomplishing something destructive.” Morrow’s analysis of people who seek to be the Prince of Darkness and only make it to be the Clerk of Darkness is highly amusing. I would recommend Morrow’s book to anybody seeking insight into ethnic conflict, be it in the Balkans or Africa, or into evil in academia and the bureaucracies of our own countries in the West.